Shortly after hosting a Black Lives Matter rally, where only students of color were invited to attend, Chicago-area Oak Park and River Forest High School found itself at the epicenter of community upheaval. 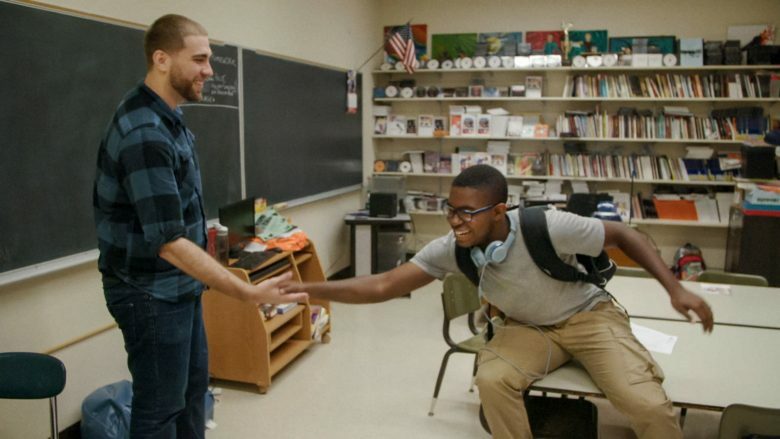 Academy Award-nominated filmmaker Steve James took the opportunity to spend an academic year allowing students, family, faculty, and administration to share the stories of challenges teens face today, uncovering the role race plays in affecting the educational experience for racial minorities. Impact partner and producer Participant Media approached A Hundred Years to develop a conversation guide to accompany the release of the resulting docuseries, America to Me, that debuted late summer 2018 on Starz. You can find American to Me: Real Talk with free downloadable material here. 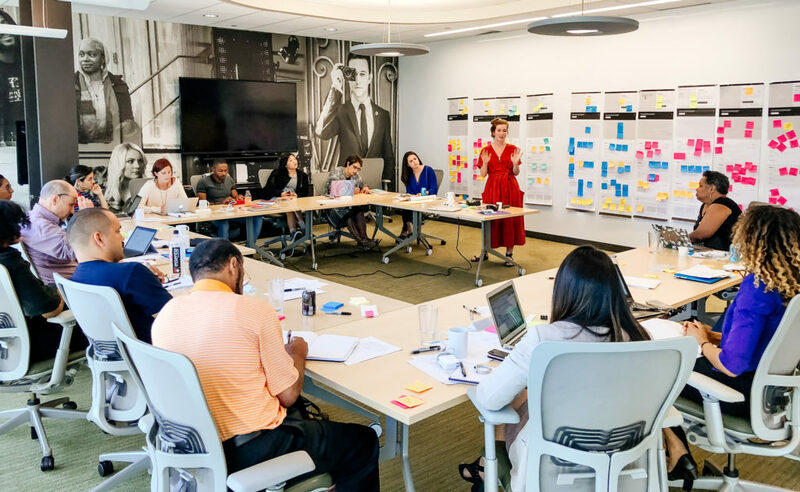 We collaborated closely with impact partner Participant Media and an advisory committee made up of educators and advocates known for their work in advancing racial equity to identify the greatest opportunity for impact. While initially we planned to focus on conversations between educators and administrators, together, we determined the opportunity was much broader, extending to students, educators, and individuals inside and outside of the classroom. 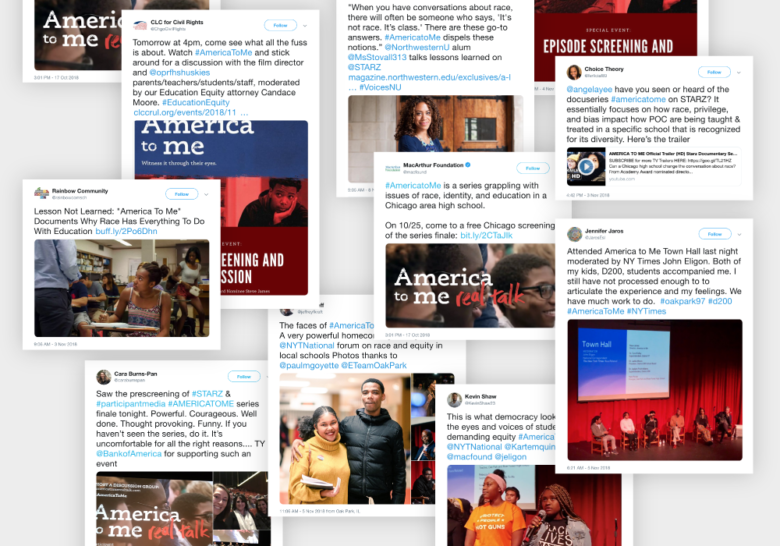 A ten-part discussion guide—America to Me: Real Talk—builds on the content of the ten-part docuseries through discussion questions, prompts for self reflection and interactive personal and group exercises. We kicked off our partnership with Participant Media with a two-day workshop hosting a group of practitioners, educators, and students to develop the content for the conversation guide. Through a series of design sprints, we developed a list of shared definitions, examined key themes, and developed a framework for hosting effective conversations. 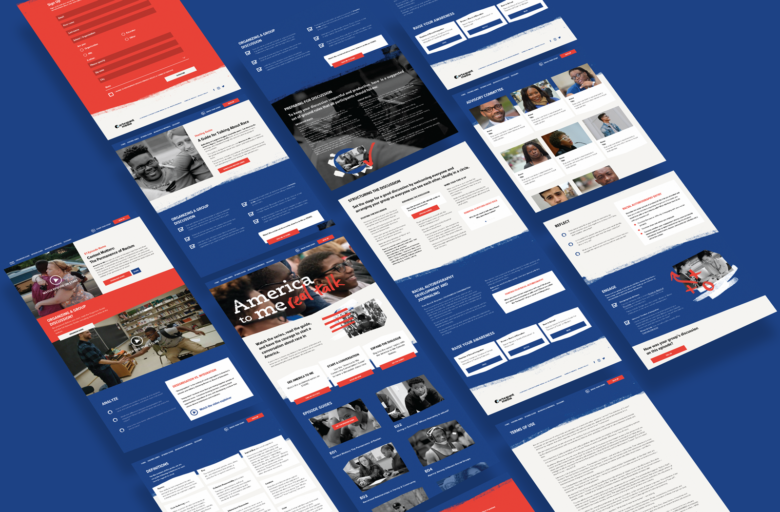 In partnership with the advisors and curriculum developers, the team created an online-based, free discussion guide that educators can use inside and outside of classrooms to help anyone understand how these larger issues affect local communities. The goal: moving from building awareness to activating systemic change, one community at a time. The response has been remarkable: Throughout the airing, Participant Media hosted episode viewings followed by a Real Talk panel and discussions with a cross-section of stakeholders, students, parents, and politicians to drive local action. To date, there are about 1,370 registered watch groups in 34 states with over 11,262 participants using America to Me as a catalyst to ignite conversations around race, education, and equity. Additionally, Uplift Charter Schools in Dallas have embedded America to Me into their 9th, 11th, and 12th grade classes, reaching over 1,500 of their students. And over 47 school districts that serve close to 1.2 million students across the country have asked for district licenses to bring America to Me: Real Talk into the classrooms to use with students and staffers for professional development. The America to Me: Real Talk campaign is ongoing; join the conversation and learn about the ways to get involved at americatomerealtalk.com. The series has sparked a national conversation in schools as well as online platforms like Twitter.